Daily DOSE Farm: "Ehh, what's up, doc?" I planted these carrots without any soil preparation. I just sprinkled the seeds around the tomato plants for companion planting. Some of them forked out. 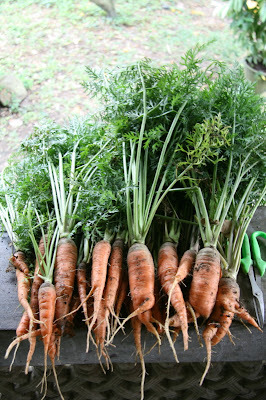 Be sure to cut the leaves (leaving only 2 inches above the rootcrop) of the carrots immediately after harvest. This will keep your carrots from becoming rubbery and stay crunchy longer.